With over 850 members, the Alliance website is a valuable resources to connect with the nonprofit sector and our supporting industry partners. You can use the links below to connect to our members in a variety of ways. 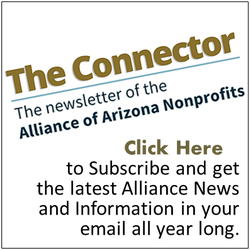 Any visitor to our site can view a directory of our nonprofit organization members by clicking on the "Connect W/The Sector" tab and then clicking on "Find a Nonprofit". Or, click here. The online membership directory allows Alliance members to find and connect with each other using our interactive technology platform. Members, and their employees or board members, can each create their own customized profile, showcasing as much, or as little, information as they choose. Members can then search for other members using a variety of search fields, like name, organization name, geographic area, cause area and more. Please note: The Membership Directory is a members-only area of the site. To access the directory, log in to your profile using the box on the right. After you log in, you will then be able to see the "Membership Directory" link under the "Membership Information" drop down menu above. Click here to learn more about our online platform. If you are searching for a for-profit company that provides products or services to the non-profit sector, you can find them by searching the Resources for Good Directory. Click on the "Tools & Resources" tab, and then click on "Business Directory". Or, click here.